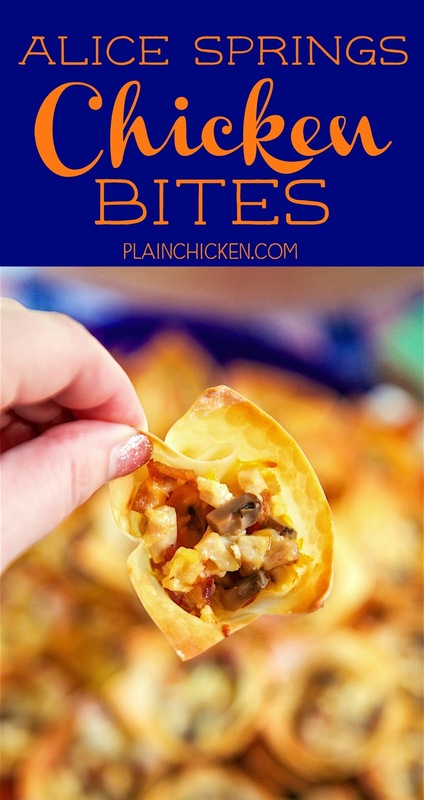 Alice Springs Chicken Bites - chicken, bacon, honey mustard, cheese and mushrooms baked in wonton wrappers. SO good! Can make ahead and bake later. Great for parties and tailgating. These are always the first thing to go!! Alice Springs Chicken is my favorite thing to eat at Outback. I love all the flavors - chicken, honey mustard, bacon, mushrooms and cheese. I decided to put all those flavors in a yummy tailgating snack. OMG!! SO good! I could not stop eating these. Chicken Legs and I ate these for lunch and loved them. You can mix up the chicken mixture ahead of time and filled into the wonton wrappers when you are ready to bake. These Alice Springs Chicken Bites taste great warm or at room temperature. I have also reheated them for lunch the next day. They tasted great! 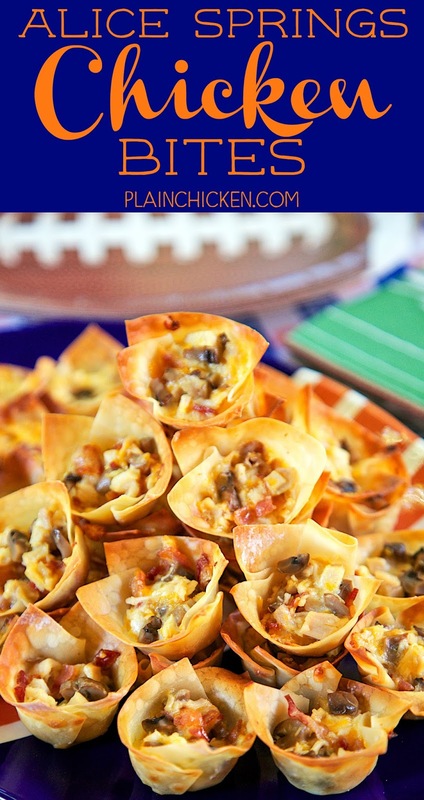 Make these for your next football tailgate or party. I promise they will be a hit!! Preheat oven to 350 degrees. Spray mini muffin pans with cooking spray. Combine chicken, bacon, cheese, honey mustard, and mushrooms (if using). 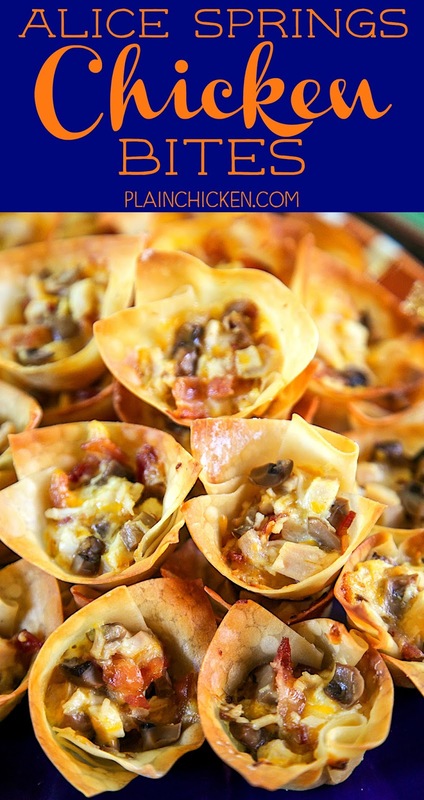 Place wonton wrappers into sprayed mini muffin pan cups. 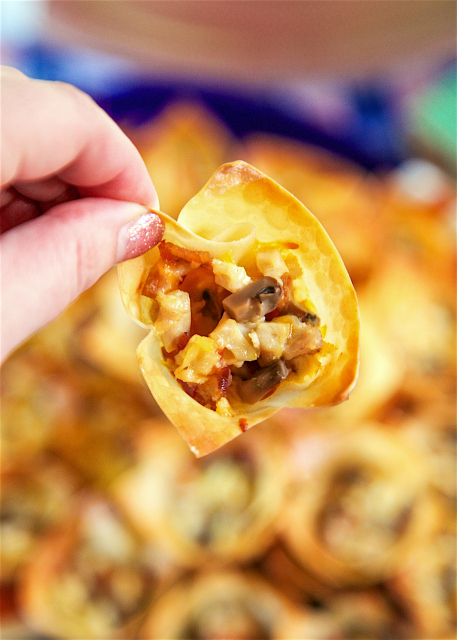 Fill wonton wrappers with chicken mixture. Bake for 15 to 18 minutes, until wrappers are golden brown. These sound amazing. I always ordered that when I used to frequent Outback. 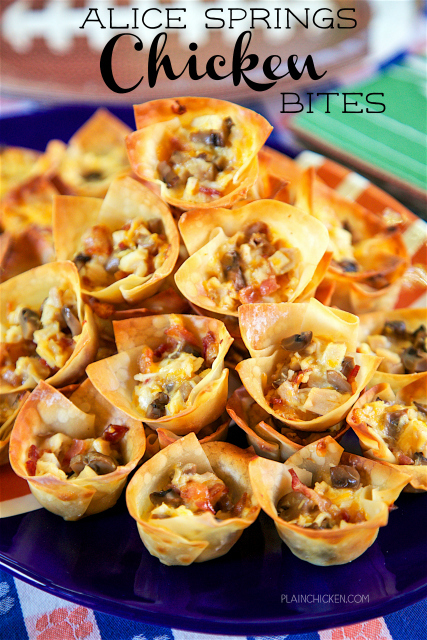 I bet they would be great in mini phyllo cups as well!